If you have tile or wood floors, you know that kids can easily take a tumble when they’re running in socks. 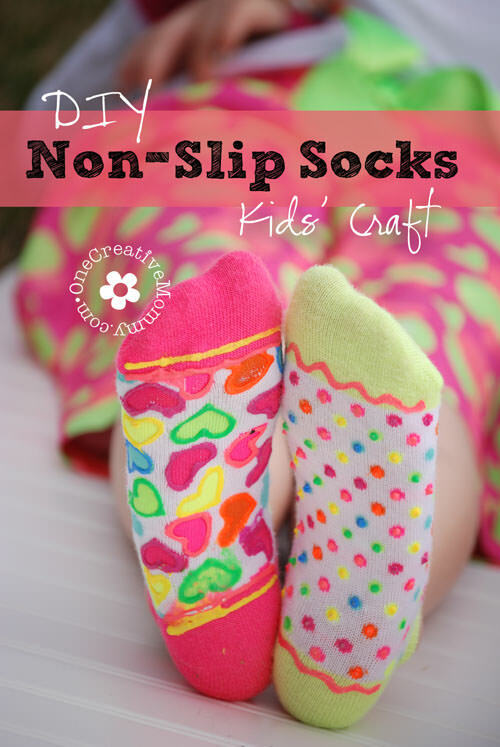 Keep those little ones off the ground with my DIY Non-Slip Socks! 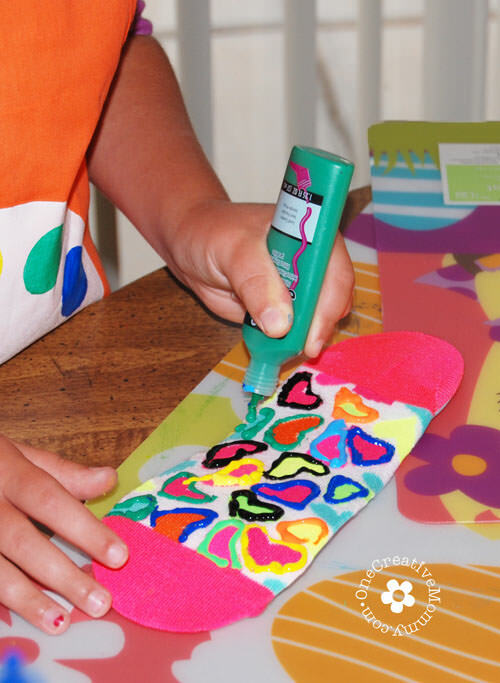 Cardboard feet cutouts to go inside the socks while painting (you can download a free pattern at the end of the post). My instructions are as if you are doing this at a party. If you are doing it for your own family, you won’t have to worry about some of the steps. 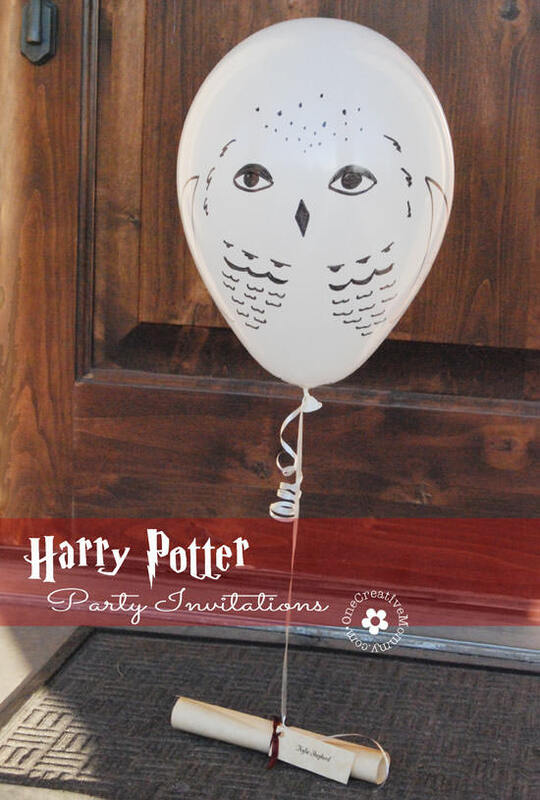 Before the party, cut out several feet patterns from cardstock (or let your Silhouette cutting machine do all the work). When guests arrive, give them two feet patterns and have them choose two socks. 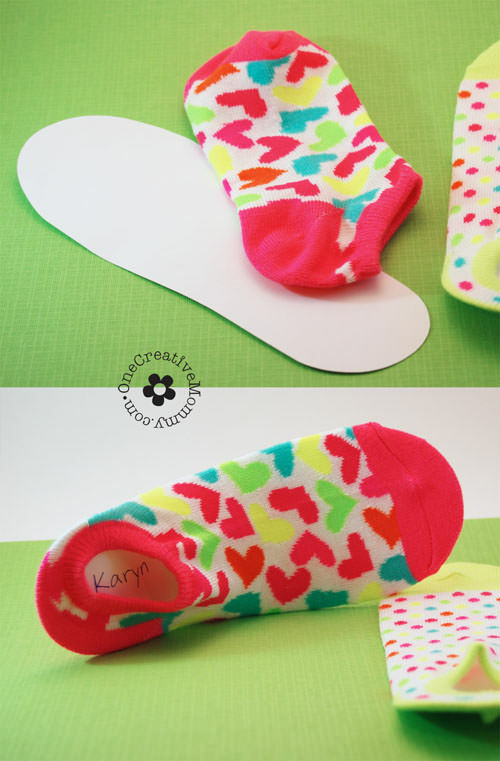 Write their name on the feet patterns and slide them inside the socks. 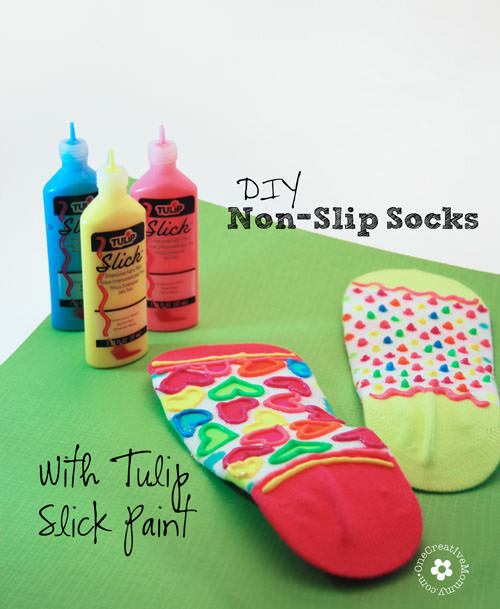 Be sure to paint on the bottom of the sock–not on the side with the hole in it. To keep your hand from dragging through the paint and smearing it, start painting at the top of the sock and then move toward the bottom. Paint! The bottles are squeeze bottles, so it’s really easy. Since the socks I bought were patterned, most kids just outlined the shapes or traced the lines and dots. You’re done! Special thanks to Twiggle Box for the idea! You can download the PDF or Silhouette files below. Thanks, Dee! I have no idea where the mismatched sock idea came from, either, but it’s everywhere! At first it drove me crazy, but now I think it’s kind of cute. I think my girls learned it from their teenage cousins! Thanks for visiting and commenting. These are so cute. Great idea. 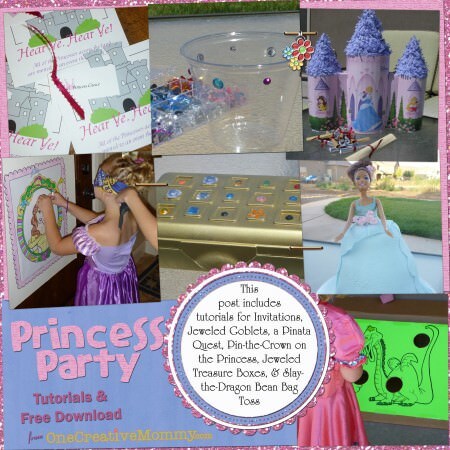 Thanks for sharing at Wake Up Wednesday Linky Party. This is a great idea! I need to do this to all of my kid’s socks. Genius! I’d love for you to come over and share at The Makers going on now at TinySidekick.com if you get a chance. Hope to see you there! Thanks, Corey! I’m all linked up. Thanks so much, Sabrina! Good luck with the basement! I LOVE THESE!! I want to make myself and my kids some! GREAT IDEA! Visiting from the Wake Up Wed Linky. Thanks for linking up! I would have never thought it would be that easy! Thanks for the tutorial! Yep. It’s super simple–and fun. Bonus! Thanks, Brenna. I’m off to check out your giveaway! Heidi, this is genius! I always look for toddler socks with the grippy rubber bottoms so my kids don’t slide around on our 100% ceramic tile floors. This is so much fun. Pinned! Thanks so much, Jelli. 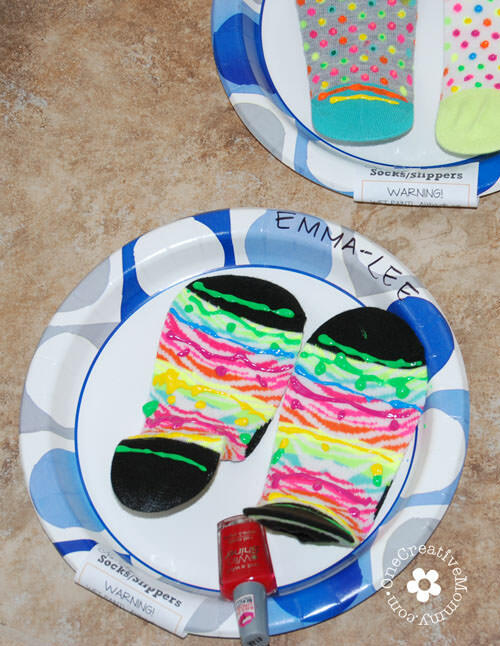 The kids really had a good time, and they definitely need these socks on Grandma’s hardwood floors! Such a great idea. My 3 year old is always falling from running on our hardwood floors. 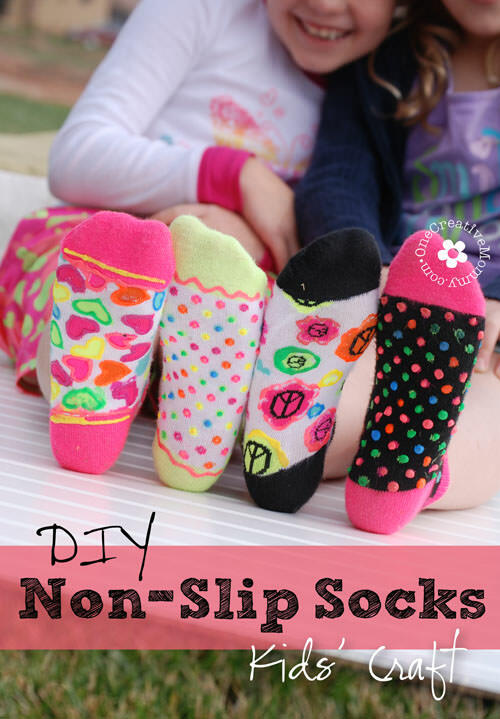 I was searching for no slip socks, and came across your do it yourself idea. This is really awesome because it was hard finding socks with grips for children past 24 months, and the ones I did find were $9.99 a pair! I will be doing this for all of my kids….I have 3 under the age of 10, so we will make a family project out of this. You just planned my party! These socks are so cute! 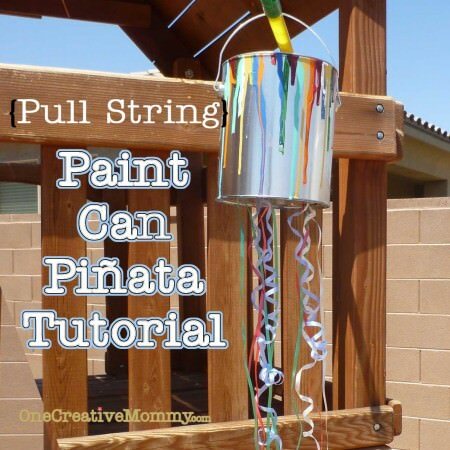 What a great idea and fun to make! wow,,, superb idea to make charming our socks by making beautiful designs on it. I have almost 5 pairs of white colored socks of school time which I don’t wear because I don’t like white colored plain socks. now I will design them as you have said and make them useful. thanks for giving me this wonderful idea.